Welcome to the RoboJackets BattleBots wiki! Everyone has seen BattleBots on T.V., fighting to the death in a gladiatorial-style arena in a shower of steel, sparks, and glory, and yet many people haven't the first clue about what it takes to build one! RoboJackets' BattleBots team tries to solve this, by teaching members to design and build a robot 1) robust enough to take multiple beatings, but 2) strong enough to deliver its own beatings in return. A good technical challenge that takes hundreds of man-hours and buckets of love. We have built battle-ready robots in the 120 lb, 60 lb, 30 lb, 12 lb, and 3 lb weight classes, including (based on their active weapon) drum spinners, ring spinners, shell spinners, veritical and horizontal bar spinners, sumo bots, walkers, and even the occassional wedge. We use mostly mechanical skills with some degree of electrical experience to implement our carefully CAD'ed designs, to personally manufacture the majority of our robots. 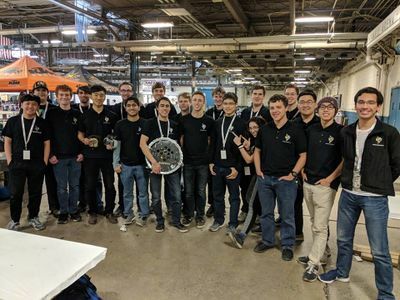 Ultimately our goal is to build an awesome machine to fight one-on-one with another robot in the same weight class, all the while learning practical applications of tooling and machining, and gaining invaluable experience in the design and manufacturing process. The competition consists of fights between robots in the same weight class. Competition rules place certain limits on weapon design and robot weight, for a fair contest and for the safety of the observers. For instance, entanglement weapons such as ropes or nets are prohibited along with invisible weapons such as electrical interference. This focuses the robot design on aggressive weapons designed to break apart or incapacitate the other robot, and the only limit on this type of weapon is that it is well engineered so as to not harm the people around it. The presence of these aggressive weapons forces the robots to be designed to withstand large shock loads, both mechanically and electrically. The challenge of the BattleBots team is unique in that a balance needs to be reached between defensive and offensive abilities, all while ensuring that the robot is very robust in all aspects. Even a single wire or bolt coming loose will cause defeat in an intense fight! This year we plan on attending two competitions, Motorama in Harrisburg, PA and Robogames in San Manteo, CA. We meet in the Student Competition Center (Building on 14th Street). Wear closed-toe shoes and a t-shirt (long sleeves must be rolled up) since we will be using the machine shop. Bring a hair tie if needed. Consult the #carpool Slack channel for information regarding the time and place of the carpool.